There are many reasons to stay in Greece. 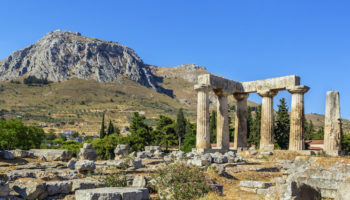 The country is the birthplace of democracy, the Olympics, and a host of beautiful myths of gods, goddesses, and heroes. It has a plethora of spectacular ruins and art pieces in every corner of the country to explore, many of which are thousands of years old. People here are festive and warm, and bring with them a culture and cuisine that celebrates what is great about living here. 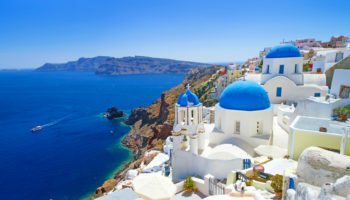 The beauty of the Mediterranean Sea and breathtaking islands like Santorini, Mykonos and Crete make it one of the world’s most spectacular sites. 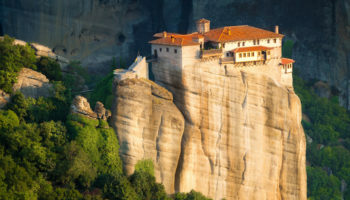 The choices of hotels in Greece are vast, and there is a perfect fit to be found for the family or the solo traveler, the budget-conscious, the ecotourist, and the high-end luxury nomad. Furnishings range from simplistic to lavish, and from ancient to hip and ultra-modern. 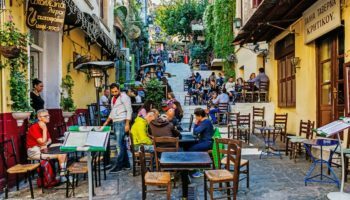 Locations can be far from the beaten path and authentically Greek, a slice of the home country in a foreign land with all of the expected amenities, or urban and full of new adventures to experience. This multi-tiered cliffside resort in Santorini is designed as a modern interpretation of a traditional Cycladic village. 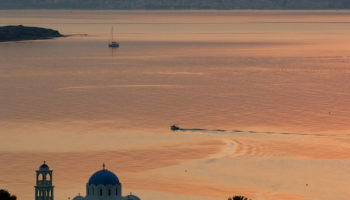 It is perched with a perfect view of a dormant volcano caldera over the deep blue Aegean Sea. The Astra Suites hotel constantly wins top 25 in the world accolades, and the high end suites offer luxuries like private heated swimming pools. 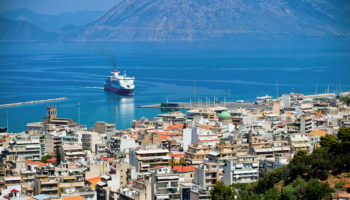 Its location near the smaller town of Imerovigli allows for all of the culture with fewer crowds. This is perfect for those who want the privacy of romance with opportunity for adventure. This boutique hotel is a few miles outside of the town of Mykonos, and features 24 luxury suites perched along an infinity pool over Megali Armos bay. The name comes from the slang term, “to bill and coo,” meaning to whisper endearments, and takes on a double meaning here, as it is a perfect place for couples, and every aspect of the resort from rooms to spa and Mediterranean-influenced gourmet restaurant is designed to make guests feel pampered and cared for. The Anemi Hotel consists of several white plaster block buildings along the gray rocky coast of the island of Folegandros. The sleek modern design of these buildings uses accents of stone from the island to create a clean, natural elegant aesthetic. The hotel is family friendly, and offers children’s programs and a kid’s cinema and children’s pool onsite. Special accommodations like pillows to prevent cervical issues are touted on their site and available for guests with special needs. This family-friendly boutique hotel sits right on the white sands of the Aegean, and goes out of their way to be kid-friendly. 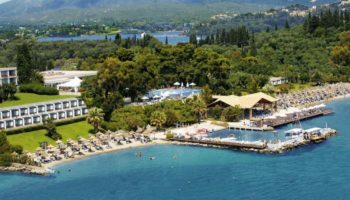 Rooms at the Sani Asterias Suites are spacious with plenty of room for larger family groups. The grounds are expansive with plenty of green lawn for play, shallow pools for safety approaching the water, and childcare in the form of organized activity or babysitting services. 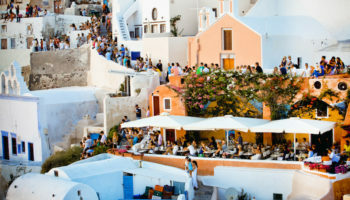 This five-star Starwood hotel sits in the hills of Oia and offers guests all kinds of luxuries. Access to outdoor sporting events like horseback riding and scuba, infinity pools, and Asian and European spas are just the beginning of the amenities at the Mystique Santorini. High-end clients can request luxury items like butler service and private helicopter transportation to and from the mainland. Rooms consist of suites and villas, and all have luxurious in-room jacuzzis, though amenities increase from there. This hillside hotel on the island of Rhodes sits just a short walk from the town of Lindos, but feels secluded with its position over beautiful Vilha bay. The Lindos Mare Hotel can be a secluded getaway, as a stay in one of the approximately 100 rooms and suites offers a chance to enjoy the beach, freshwater pools, tennis courts, restaurants and spas. 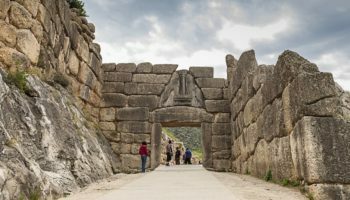 However, a walk or drive nearby offers many opportunities to see the acropolis of Lindos and historic Rhodes. Modern luxury meets classic Greek architectural design in this five star beach resort. The Mykonos Grand Hotel is located on the beach of Aiyos Yannis, just outside of Mykonos town. Rooms range from simple to high-end suites, and guests here can choose from a number of on-site restaurants, or even pre-order a personalized dining experience as a candlelit beach meal, barbecue or picnic. Athletic facilities, spa and fitness classes is all available as well. The architecture of Katikies is spectacular and unique. Carved into the white cliffs of Santorini are several levels of spectacular, one-of-a-kind rooms and suites with simple, arched roofs. On the decks are spectacular sea and island views, and turquoise pools sit on balconies perched high over the water with similar chiseled white archways. The outdoor balcony restaurant and onsite spa make this the perfect place to relax in elegant beauty and luxury. This iconic landmark sits in the heart of Athens, just steps from the Acropolis, Syntagma Square and the Parliament. The Hotel Grande Bretagne was originally built for a Greek businessman just a decade after the nation’s independence from the Ottoman Empire. The building continues to highlight the elegance of 19th century opulence and design, and gives guests an opportunity to stay in rooms and suites fit for the royals. 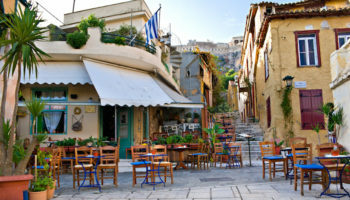 A rooftop garden and dining establishment allows visitors to see the sights of ancient Athens from up high. Infinity pools and beachside spas are taken to a new level on this Crete gem. The Blue Palace Resort boasts a long pool that heads into the sea, with your choice of pool or ocean just feet away from one another. Classic Greek archways lead the pools under protected lanai areas for rainy days. Views and sailing trips to ancient Spinalonga island are easy to find here, and the resort offers both private rooms and suites as well as public gathering and wedding venues. The stark beauty of the Perivolas lies in both location and architecture. Built into the cliffs overlooking the Aegean sea, this hotel offers a beautiful infinity pool that appear to hang straight over into these ancient waters. 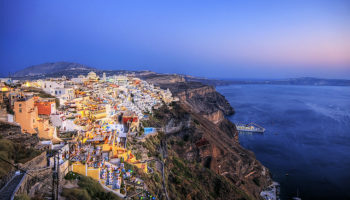 The hotel is a restoration of traditional Santorini cave homes that once housed fishermen and farmers, and is a celebration of traditional architecture with a luxury twist. Circular doorways and built-in arched recesses for beds and tables, hot tubs in the floor of rooms and balconies with water views are just some of the treats to discover here.